Over half the world's population today is using e-mails for communication, be it official or for personal. This is a huge market which needs to be addressed by the marketing teams of various companies. It is important to have an attractive e-mail template designed to catch the attention of the readers and potential buyers. 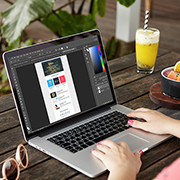 Although e-mail designing can be done in-house, it is time consuming and adds up to overall expenses. So, the best option is to outsource e-mail design services. Outsource2india is an outsourcing firm offering creative and innovative services of e-mail design. We can help you with attractive and eye-catching e-mail designs. Our team of innovative designers has the required knowledge and skills to provide you with highly impactful e-mail template designs that precisely cater to your needs. We have a team of designers who use the most innovative and efficient processes to produce some of the most attractive e-mail templates. Our designs can help your marketing teams to create a lasting impression on the customers. If you already have an image designed for the e-mail, then our team can help you convert the same image into an HTML format. We ensure that all the elements in the design are carefully created and all the links and other elements work fine when the e-mail is sent to the customers. Most of the e-mails today are read on the mobile phone, and hence it is important that your e-mails open in smaller screen devices without any glitches. To ensure this, our team of e-mail designers can help you design responsive e-mail templates which will convey the message to the customers irrespective of the device they are using. Our team of e-mail designers and HTML validators can help you validate the existing e-mail designs. Our team is proficient enough to make the required changes and also suggest you other changes which could help you make the design and functionality of the e-mail better. We have the required skills and expertise to provide creative animated e-mail designs for your marketing campaigns. These animated designs will help you to attract the attention of the readers and keep them captivated for a longer time. We can provide you with the best-quality designs within a quick turnaround time. Why Should You Choose Us for e-mail Design Services? Outsource2india has been a leading provider of e-mail design services in India and has provided quality services to global clients for over 18 years now. Our experience of working with clients from different industries and different parts of the world has enabled us to provide top-class services. Our quick and cost-effective services have helped clients to save a considerable amount of time and money in the long run. Other design services we provide include graphic designs, logo designs, illustration designs, brochure designs, etc. If you are looking for a reliable, efficient, and innovative design service provider for e-mails, then you have come to the right place. Get in touch with us today.